Did you know that reusing and sharing files across multiple courses in Moodle is possible? It is possible to have a single copy of a file that is used in multiple courses and when that file is updated, the changes are reflected in all the courses. Well it’s actually quite simple, yet the documentation around it isn’t great. So this blog post aims to address this. Here goes..
Let’s say we have a tutor who teaches 4 separate science courses. This teacher has a file (Period Table of Elements) and he uses it on all courses. Occasionally he makes tweaks to the document and each time he does, he has to remember to upload the updated copy to all his Moodle courses. – He doesn’t like doing this. We use Moodle alias files/shortcuts. Sounds easy right? Well actually, it is, although it’s not the most intuitive way of working. Here’s how it’s done (from a tutor perspective). Make sure you have editing rights to at least 2 courses. Create a file resource in the usual way (Turn Editing On >Add Activity or Resource > File) in course 1. Now we are going to reuse this file in another course (course 2). 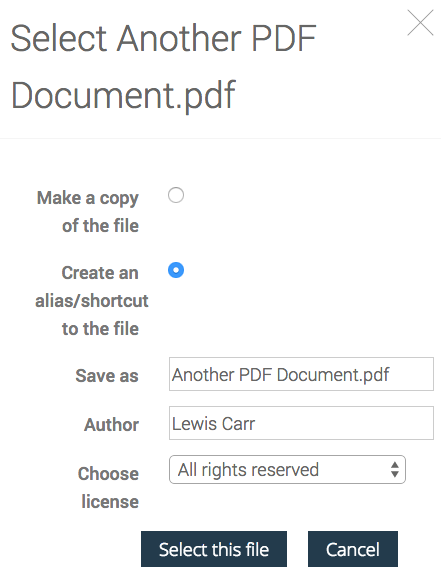 Now when you click on this file you have the option to make a copy of the file or create an alias/shortcut. So go ahead and select alias/shortcut, save the resource and return to the course. That’s it, you have created a shared file in Moodle. Whenever the tutor makes a change to the original file in course 1, then these changes are reflected across all the courses that share that alias. Alias files can be used for modules/units that are shared across multiple courses, for example BTEC’s. I’ve lost count of the times a college or tutor has created meta courses just to share files. Alias files could also be used for student course handbooks. A college could have a single course where they store all the student handbooks and then use alias files to place them in each course. Then, when the handbooks change (at the start of a new term) the edits are made once and reflected across the entire site. The biggest pitfall is that there isn’t an elegant way to manage content and track file sharing in core Moodle. 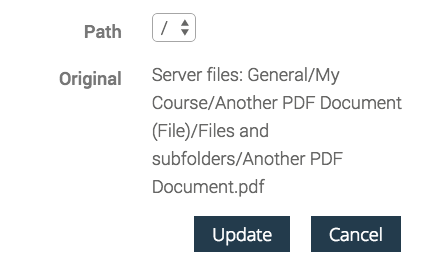 In order to find the referencing file, the tutor has to go into the edit screen of the file, and click on the file to see the originating path. It’s by no means a deal breaker, and tutors who control the document should remember where they are placing things. So what happens when a tutor accidentally deletes the master file not knowing that other tutors had created links to it? Well cleverly, the alias file becomes an actual course file when the original is deleted. So it’s copied to the course and not lost. Which is actually quite amazing. OK, I hear you ask..what happens when a course is deleted? Well, amazingly, the alias becomes a course file, so again nothing is lost. So now you know. Alias files are awesome. They’ve actually been around since Moodle 2.3. I took it for granted and thought that everyone knew about them, but the more conversations I have with organisations up and down the country, the more I see people still struggling with sharing files and uploading multiple copies of files.